If the mainstream approach to enterprise-architectures is broken – and so badly broken, at that – then why is it broken? In what way is it broken? What are the core reasons behind why it’s so broken? To illustrate this, I’ll revisit some of the content from those mixed-up messages referenced in the previous post on ‘Broken’. As we’ll see later, we can trace all of the problems seen here back to the same root cause: attempts to apply the linear-paradigm to contexts where by definition it cannot succeed. In effect, it’s exactly the same root-cause as in all the problems that we saw with ‘No jobs for generalists‘: a set of ideas and assumptions that are not inherently wrong as such, but definitely are wrong when applied to the wrong kind of contexts. Which, these days, mostly are the wrong kind of contexts. “A notional future that is still not totally proven”: right there, in just nine words, is the epitome of the linear-paradigm, and why it doesn’t work in business. There’s an explicit assumption there that the future is predictable, that we can have – and are entitled to have – proof that would provide certainty about future outcomes. Nice idea, and yeah, in many ways that would be nice to have, especially in business – but in reality, unfortunately, it is literally unrealistic. Prediction only works when the real world is kind enough to line up to our assumptions. When it doesn’t line up… well, that’s when things are literally unpredictable. But we must never forget that the real world is the real world: if we don’t get the results that we expect, it’s our expectations that are at fault – not the real world. But now turn the focus back to Earth, back to everyday business – and realise that most businesses are dealing with wicked-problems that are often many orders of magnitude worse than that of the Mars lander. And you expect that to be predictable, a ‘proven future’? – c’mon, let’s be a bit more realistic, shall we? There is only one time when a future can be considered ‘proven’ – and that’s when it’s no longer a possible future, but the unchangeable past. Imaginary worlds are predictable; selected subsets of the real-world can be in some cases be almost-predictable; but in the real-world as a whole, there is always some inherent-uncertainty. Hence in the real world, there is no such thing as a ‘provable’ future – and the idea that there could be such a thing as a ‘provable future’ is a delusion, a fantasy, nothing more than that. So much of policy direction seems to be driven by a Faustian ambition to control the threat of the unknowable future. The simplest summary is that the linear-paradigm does work well when the context is stable. It can have almost any amount of variety – be as complicated as it likes – as long as the variety itself of that variety remains much the same. And that is the kind of contexts that the business-world experienced for much of the past century – particularly from the early 1950s to perhaps the early to mid 1980s. Hence, not surprisingly, an increasingly-entrenched assumption that the linear-paradigm was the way to do things in business. But the reality is that the linear-paradigm is not ‘the way’, but merely ‘a way’ – and it’s a way that only works well when the variety-weather is stable. Which, these days, is increasingly no longer the case in business: it’s already decidedly stormy, and every trend and indicator suggests that it’s going to get much, much stormier yet. Hence, in current business practice, and other than in certain very narrowly-constrained business-contexts, trying to rely on the linear-paradigm alone is guaranteed to fail. Techies invariably screw up the business; business guys screw up the tech. For decades we’ve looked for someone to span both — and that’s what Enterprise Architects do. In short, it’s the darn linear-paradigm again, but with an additional twist: our view is right, therefore everyone else’s is wrong. Perhaps the best way to summarise this is one of Edward de Bono’s ‘Laws of Thinking’: everyone is always right, but no-one is ever right. Everyone is right from their own perspective, yet no-one does or can hold a fully-predictable version of the whole picture. So when there’s a clash of perspectives, all and none of the perspectives are ‘true’: they each hold a partial truth, not ‘the whole truth’. Which means that the moment we have a clash of perspectives, ‘the truth’ is going to be inherently ambiguous, inherently uncertain – and inherently arguable, too. But here’s the catch: the linear-paradigm can’t handle ambiguity. That’s actually its great strength, because its refusal to accept ambiguity is what makes predictability possible. Yet that same strength will become a serious problem whenever the context is inherently-ambiguous: in a sometimes all-too-literal sense, the linear-paradigm collapses into a kind of insanity there. Which means that, by definition, anyone who bridges across more than one domain – such as enterprise-architects – must be able to go ‘a little bit insane’, in order to reach above the self-contained ‘sanities’ of each of the different domains. Also, since everyone is always right but no-one’s ever right, there is no single domain that holds ‘the truth’ about the business: so in a viable ‘architecture of the enterprise’, we must assert that everywhere and nowhere is ‘the centre’, all at the same time. 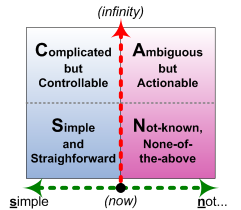 And since business-strategies must, almost by definition, straddle across every domain of the enterprise, there is no way that we could move those strategies “through your company on logical, straight highways” – because the ‘logic’ itself will change as we go through each of the domains. The horizontal axis here is a measure of modality in the context – in effect, the extent of its ambiguity and uncertainty. The red dividing-line represents what I call the Inverse-Einstein Test: to the left, doing the same thing gives the same results, whilst to the right doing the same thing may give different results, or we may need to do different things to get to the same results. To use Cynthia Kurtz’s terms, the left represents a world of order, whereas the right is a world of unorder. In effect, the real world bounces us around all of that frame, all of the time. But if we can constrain it for a while, we can usually get to something that sort-of resembles predictability or control. For a while, anyway. That’s how we get things done. Most of business lives within contexts that always contain some degree of ambiguity and uncertainty – a world of at least some inherent unorder. Most business-folk don’t like this, will spend a lot of effort trying to get away from this – but they’ll know all too well that it is an inescapable reality in their world. By contrast, most machines and, especially, most digital technology will and must reside almost exclusively in a world of order. (If whatever-it-is isn’t in that ordered world, we’d usually say that it’s not working, or broken.) In effect, it’s a world that really does depend on the linear-paradigm remaining valid within its contexts. So whilst business guys and techies will both desire an ordered world, most techies will assume that they’re already in it: not just the linear-paradigm, but the linear-paradigm squared. Which means that the mindset most needed to work well with the often enormous complications of the IT-world is also likely to be the least suited to deal with the inherent ‘insanity’ of bridging between different domains. Or, to put it another way, IT-folks are almost the least likely people to be good at doing any kind of true cross-function enterprise-architecture. In a viable enterprise-architecture, everywhere and nowhere is ‘the centre’, all at the same time: there is no single epicentre. Asserting that a single point or domain is ‘the epicentre’ of an enterprise-architecture is, by definition, falling into the linear-paradigm delusion that there is a single ‘the truth’ to which all others should align (hence the dread phrase ‘business/IT-alignment’ and suchlike). Centring everything around a single epicentre almost invariably leads to an architecture whose ‘roads’ look straight and logical from that single viewpoint, but are completely broken and unusable when seen from anywhere else. Hence the moment someone asserts that there is a single epicentre to their enterprise-architecture, they’ve already blown the architecture – it really is as simple as that. We can have a sort-of epicentre to a domain-architecture, because the whole point about a domain-architecture is that is all about that one domain. (TOGAF is a good example of a domain-architecture with its epicentre placed somewhere within the overall IT domain.) And we can use somewhere – anywhere – as a kind of ‘temporary epicentre’, a place where we focus most of our current attention: but that’s very different from asserting that it is ’the centre’ – a perhaps-subtle distinction, but one that is crucially important in practice. In short, if it’s not a literal ‘architecture of the enterprise’, dont call it ‘enterprise-architecture’. Please? Yeah, you’re right, I’ve complained enough already… So in the next post in this brief series, I’ll stop complaining about what doesn’t work, and focus more on what does work: some real, practical, proven tactics for working with a true cross-domain space. In the meantime, comments, anyone?